Installing apps to iOS is easily done through the App Store, but uninstalling apps from the iPhone, iPad, or iPod touch is probably even easier. Yes, many users will know how to do this, but it always surprises me how many people don’t know how to remove an app from their iOS device. Fortunately, Apple has made app removal remarkably simple on the iOS platform, and it’s no exaggeration to say that you can completely uninstall an app in just a few seconds flat. You only need to learn to do this once and you’ll get it, it’s that easy (I promise, Mom!). For the purposes of this walkthrough we will cover the fastest method possible to delete an app, and that means uninstalling apps through the home screen, where all the app icons are, using the tap-to-wiggle trick. This works the same on all versions of iOS and all devices, whether it’s an iPhone, iPad, or iPod touch. 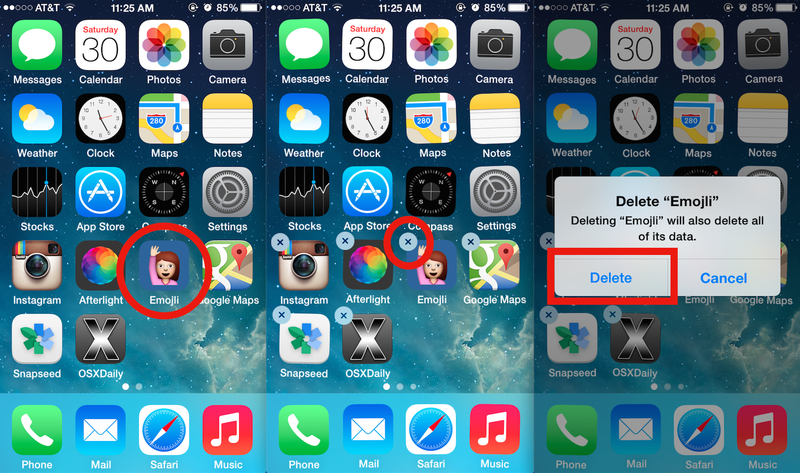 You may notice that some apps can’t be deleted, like the ones that come preinstalled on the iOS device from Apple. This includes apps like Camera, Safari, Phone, Music, Photos, Calendar, App Store, Game Center, and quite a few others. Since you can’t choose to uninstall those apps, an alternative solution is to hide them instead, making them invisible and inaccessible on the iPhone or iPad. What if I deleted an app that I didn’t mean to? Don’t worry if you accidentally delete an app while doing this, because you can easily restore the app back to the iOS device again. That’s because while deleting an app this way removes it from your iOS device, the app itself is still tied to your Apple ID. Basically this means if you bought the app or downloaded it while an app was temporarily free, it will always be re-downloadable again through the App Store using that same Apple ID. There is no limit to how many times you can delete and re-install apps this way. Perhaps even better, you can even delete an app from one iOS device, say an iPhone, and then re-install it later onto a completely different device, like an iPad. The simplest way to do that is by removing it as instructed above, then browsing Purchased App history for apps not installed on the active iOS device – even if it was a free app it will appear in this purchased list, and you can quickly download it again to the new device. Add people to your “Favorites” list in the Phone app, that’s the fastest way to make a phone call. Or ask Siri to call someone for you. That’s fast too. You can press the Home button on an iPhone 4s or later. Then, after one second, you can say, “Call John Doe at home,” and Siri will initiate the telephone call to John Doe’s home telephone number. It is important to ensure that everyone’s telephone numbers and addresses are marked as home or work (or mobile, etc) so that this option and others work as they are expected to work. LOL. I guess I’m the only one who got your sarcasm. It was funny on it’s own until I read the responses of people who actually replied to you like you were serious. Now that was funny. Can you create a tutorial on removing “other” data from iphone? ^^ is right, it takes up way too much space and there seems to be no way to find out what/where it is. Tap = a quick touch and release. You might rephrase your “tap” as “press and hold” or “press down “… Until… the icons jiggle. What the? You actually wrote this? Lol! We try to provide information that covers a wide range of knowledge about Apple gear, so while many people know how to do this, I regularly encounter users who don’t – the article is aimed at the latter, not the former. this does not UNINSTALL aps on my iPhone. they are only deleted from the screen. when I have tried to reinstall aps that had frozen or that I have wanted to start playing at the beginning and had deleted, using this method, they came back exactly where they had been. I couldn’t reinstall them from scratch. any advice? Kathy, it sounds like you did not read the article or perhaps you are not sure how deleting apps works, or maybe you are doing something completely unrelated. 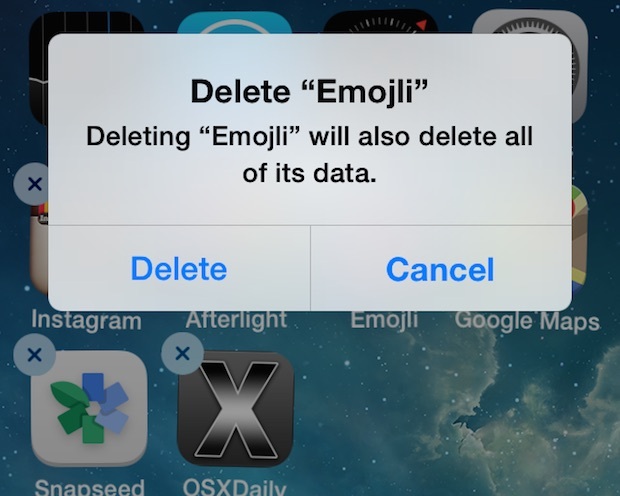 This is how you delete apps from an iPhone. It absolutely DOES UNINSTALL apps on every iPhone. When they are removed from the screen, that signifies they are deleted. The app is deleted and uninstalled. If you read the article and use the advice to delete an app, you will notice it says “Do you want to delete this app?” and you tap on DELETE to confirm that you want to uninstall the app. Is there a way to delete all of an app’s data (e.g., old copies of magazines) without deleting the app itself? Is there a way to delete this article in seconds? It’s a waste. How many seconds did it take you to write your wasteful comment? It does not work. No x appears on the main page and no delete option exists under settings. Now what, please? It works this is how you uninstall an app in IOS, you have to tap and hold on an app to make them all jiggle, then the (x) appear so that you can delete it from the iPhone, iPad, or iPod touch. The only way it wouldn’t work is if permissions are locked down and don’t allow app removal. Thx, but no x appears on any app, either oem or downloaded. at this time how can i remove or delete apps, or how can i unlockd down and do allow app removal. This is not answeing the question. For example– before i found out that they were completely useless without microsoft 360, i downloaded exell, powerpoint and word. These are stuck in my ipad and i have tried sliding the icon to the left so that the ‘hide’ icon appears. I tap this, close and re- open the app store purchaised section and , lo and behold, there they all are again ! What we want is a way to remove all record of these apps from our ipads PERMANANTLY ! My problem is that I have an iPhone 4, iPod Touch, IPhone 6 and an iPad all connected to each other and for some reason I am unable to delete apps from any of my Devices. Please help!! how can i uninstall a icloud in my iphone or ipad? I have the same problem as Pete when he mentions about how he cannot permanently remove unwanted apps…on my iPad I have downloaded a game called Zenonia and after I thought I removed it ( from my home screen) I literally thought it was gone!! I was wrong..after looking thru my settings and scrolling thru my apps I still did not see it.. I am having trouble with the HSBC on- line banking app. If I delete the app as described above can I then install it again and start from scratch or will my details still be live? i am probably the most illiterate person, when it comes to computers, and how to work them. I just got a iPhone, and do not have a clue all its capable of. I accidentally deleted Facebook app, and don’t know how to get it back. Could someone tell me what to do, to get it back? I am a senior cit and find it difficult to understand a lot of tech talk. I do know how to delete the apps I have downloaded. Thank you. its worked like a charm and thanks for sharing this. Is there a way to clean up deleted apps? Not only delete them from the phone itself but from the Apple ID as well? I uninstalled Pintrest. Then it went in the cloud. It had an update, which I didn’t care about because I deleted it. When the update happened, the P icon appeared back on my home screen and it says installing. Is this app possessed? Go away. I don’t want you! What should I do? What if when the aps are wiggling no delete x is shown? While using a Battery app, I found an invisible app in Chinese running in the background. How can I remove this from my iPhone 6? The app I am trying to delete is not responding. It’s shaded on the home screen not bright like the others and when I press delete it wobbles, delete button and cancel display but it doesn’t delete when I press the delete button! I have 5C phone, and to delete an app when I keep that app pressed for few seconds I don’t get the x mark on top left side. I tried so many time, not able to delete an app like that. whats the way out to get it done. I don’t get the cross to delete my apps any more can you help . This has happened since the last up grade in which I don’t like .. Try touching the icon lightly instead of firmly. That worked for me. The Snapchat icon has been stuck inoperable while saying “waiting” for a couple of days. It will not even allow me to delete Snapchat so I can try to reinstall. Help!! 1.Go to Settings > [your name] > iTunes & App Store. 6. If you’re being charged for a subscription, but you don’t see it in your list of subscriptions, it might be billed through someone other than Apple. 7. Use the options to manage your subscription. You can choose a different subscription offering, or tap Cancel Subscription to cancel your subscription. If you cancel, your subscription will stop at the end of the current billing cycle. Note: Deleting a subscription app won’t stop the subscription. Wow, great tip! Thank you for sharing with everyone. We’ll add it in, since this is a problem quite a few iFolks get, especially those with limited device storage, like me! If I press the icon down I get a pin in the top right hand corner and an arrow in the bottom right hand corner. No X.
Don’t press the screen, just tap and hold on the icon without physical pressure. If you press the screen you are activating 3d touch which is a different thing. 3D Touch is a confusing feature for most iPhone users for exactly this reason. Does your phone need to be in a WiFi setting to do this?